The Free College Benefit is open to members in good standing, who are full dues-paying members, retired members and their families. Family is defined as spouses, children, stepchildren, children-in-law, dependents and grandchildren. Potential students’ membership will be verified by union. The U.S. Department of Education selects approximately 30% of all FAFSA applicants for a process called verification. Verification is how the Department of Education requires EGCC to confirm the accuracy of the data reported (or not reported) on an individual student’s FAFSA. During the verification process, information reported on the FAFSA is checked for accuracy against documentation submitted by the student and/or their parents. An application may be selected for verification at any time throughout the award year. Compliance with this verification procedure is required to remain eligible for the scholarship. Once you receive the Free College benefit to cover the cost of tuition, fees and e-books at Eastern Gateway Community College, you must comply with all academic, conduct, attendance and financial aid policies as required by the college, the state of Ohio and the U.S. Department of Education in order to continue to receive the benefit for each semester in which you enroll in classes toward your degree. You must also continue to be a full dues paying member of your union (or an eligible family member). You are also required to complete the FAFSA, including any required verification, for every new academic year. The Free College Benefit at EGCC does not require a placement test. However, if you are worried about how you will handle college level courses, your advisor can work with you on which classes to choose, as well as some resources to help you get ready for courses. The Free College benefit is an individual scholarship and amounts vary based on the student’s cost of tuition, fees and e-books at EGCC. The scholarship will be renewed each term as long as the student (or the family member) is a full, dues paying union member, and the student maintains satisfactory academic progress as defined by EGCC and the U.S. Department of Education for federal financial aid. As long as the student is actively participating and working toward their degree, there is no time limit for degree completion. Students must, however, complete the FAFSA and any required verification, for each new academic year. As long as EGCC has your current year FAFSA and any and all required verification forms, and you follow the rules of the college, you won’t incur a bill for your tuition, fees or books. You don’t have to stay with the union or your job for any set time period – you just need to be a member in good standing or an eligible family member at the time you start your classes. You don’t have to pay back the scholarship if you move out of the union, or your job. The Free College benefit is a last-dollar scholarship; therefore, you are required to first use any federal or state aid you may receive toward your tuition, fees and e-books. If you do not want to use your federal or state aid, you can still enroll in EGCC, but you will not be able to receive the Free College last-dollar scholarship to cover the difference for tuition, fees or e-books. Then the last-dollar scholarship will still apply. Please check with your employer as to the details on how it works. We will work with you to ensure compliance. If you are eligible for Veteran’s education benefits or tuition reimbursement through your employer, we request that you apply those benefits toward your enrollment at EGCC. New students can begin the semester at EGCC by completing and signing a form that says where you have a graduated or completed. They then have until the beginning of the next semester to submit the official proof of completion, which can include official or unofficial High School/GED transcripts OR a copy of your diploma OR official college transcript showing Associate Degree or higher. EGCC reserves the right to independently verify graduation or completion. Yes, please send in your official college transcripts in order for them to be evaluated for transfer credits to EGCC. To be eligible for the scholarship, which is a form of financial aid, you must enroll in a degree program at EGCC. However, the programs are flexible in that you can take one class at a time. A student may withdraw from a class prior to the withdrawal deadline each semester. Students are required to contact the financial aid office prior to withdrawal deadline in order to see what impact it might have on their financial aid and/or scholarship. One of union members biggest concerns is the cost of college. Today, only half of Americans who begin college will be able to finish, largely due to financial and work/life barriers. With this benefit, unions have found a way to help members and their families begin to alleviate this worry. This program started successfully with labor unions in Ohio. The demand from members was so great that more unions wanted to provide the benefit to union members and their families. EGCC, which is organized by the Ohio Education Association, is committed to helping adult and returning students be successful in earning their degree, which can lead to increased career opportunities. No. 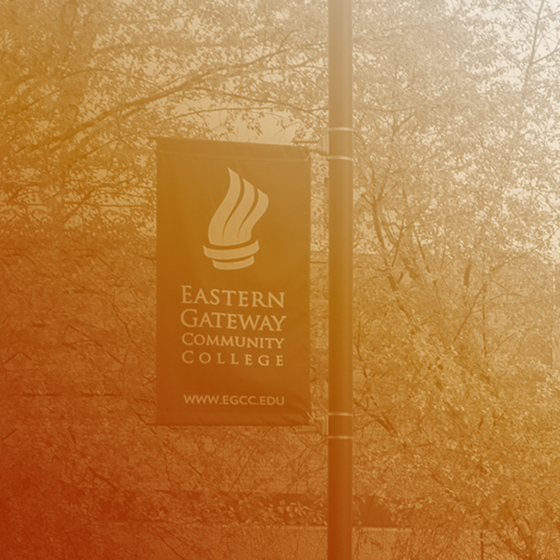 The Free College benefit is supported by Eastern Gateway Community College, who is investing in you and your future. It is not transferable to other colleges. We are working to extend the benefit to a bachelor degree program. Please check back for more information. You shouldn’t leave your union—they are providing you Free College! That said, if the circumstances are out of your control, EGCC won’t drop you from your current classes. You may not be able to continue to the next term with the scholarship, depending on your situation. If you are laid off, your union wants to ensure you continue to have the opportunity to complete your education. Eligibility verification happens with your union, not with EGCC.